A Sweet And Easy Way to Make Pivoting Rivets For Foam Armour. 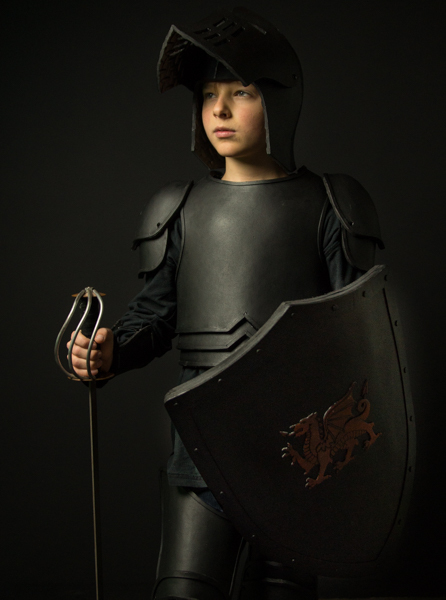 So, last Halloween my son asked me to make him some knight armour for his costume. Secretly I have been wanting to have an excuse to take the time to make a knight armour pattern, so I figured this was the time. The only tricky bit about making armour is that it needs to look like it is made of hard plates of metal, yet provide enough flexibility to fight an epic battle. Traditional armour often used rivets that were just slightly loose, so that the plates of metal could pivot, giving the wearer some flexibility. I wanted to make mine in the same style, but as I would be making it from EVA foam, I would need to figure out a way to make rivets that would work with such a different material. What I came up with was really simple, and super cheap, using 1/4 inch clear plastic tubing that you can get at any hardware store. And the end result looks really good. Almost like a real rivet. Sweet. I made a little video you can watch here that goes through the process pretty quickly. The type of foam you use is really important. The main thing that's going to be a problem is if the rivet pops through the hole in the foam, like when you blow out a flip flop. To prevent this, make sure you have a relatively dense sheet of foam, and that it is about 5mm thick minimum. Punch the hole in the foam a much smaller diameter than the tubing, so that it is a bit difficult to feed the tubing through the hole, but that will give a much stronger joint. Make the flange on the tubing as large as you can without it going all crazy on you:) That's a bit of trial and error, but the larger it is, the less chance of pulling out. Hold the tubing in place until it is cool. If you take it away from whatever is giving it the flange, it will try to go back to it's original state, and loose the shape you are giving it. When you cut off the tubing for the second side of the rivet, cut it really close to the foam. This ensures that your two pieces will be held together reasonably tightly and will not flop around on a loose rivet. There's not much to it, but it sure is a handy little thing to know. UPDATE: Here’s the video showing how to make the knight helmet and you can find the pattern in my shop. Newer PostMaking the World a Better Place, One Hat at a Time.